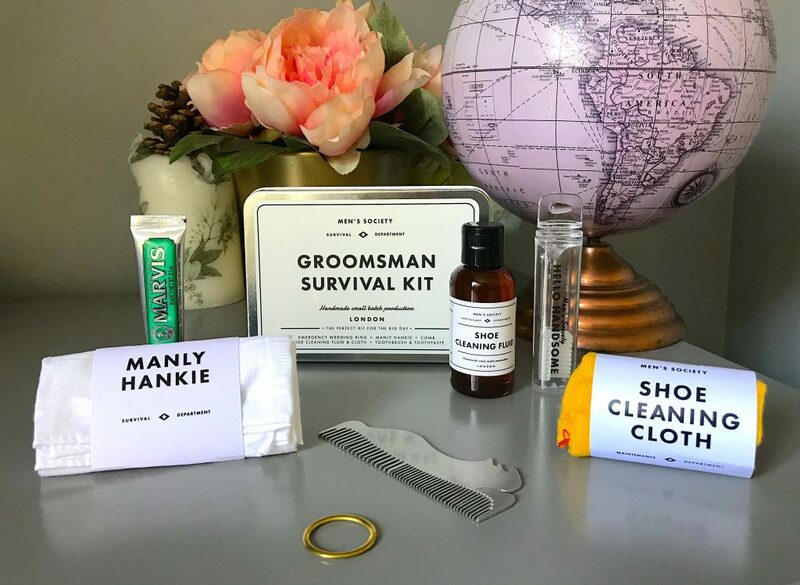 If you’re looking for men’s wedding gifts, you’ve come to the most helpful place! 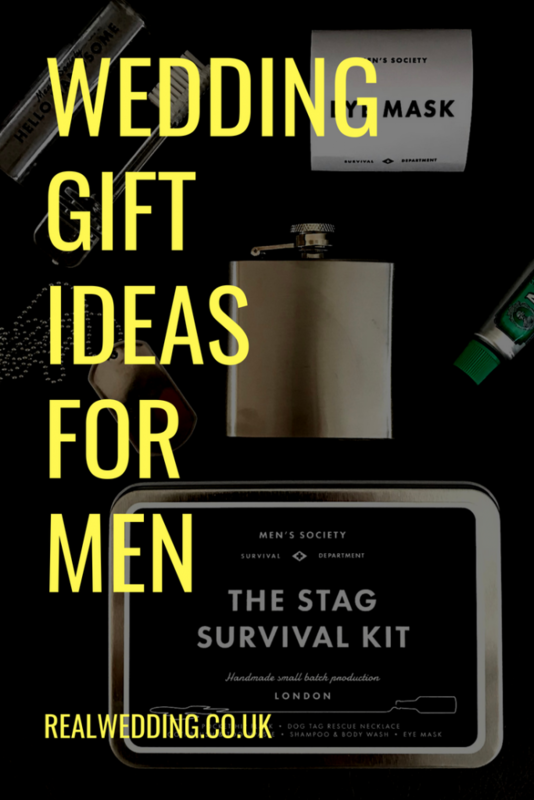 Have you ever thought how hard it is to buy gifts for men? Well, regardless, this is a round up of the 5 best men’s gifts you can give. 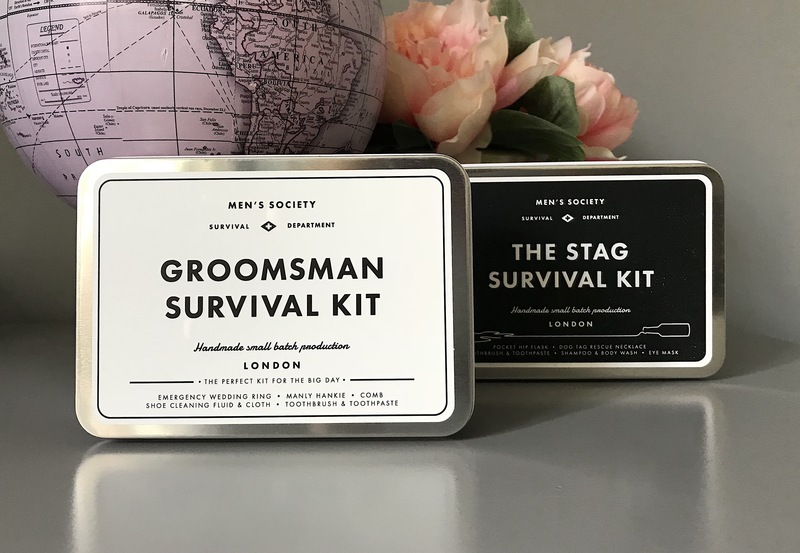 Included in this round up are stag gifts, groomsman gifts and men’s wedding favours. 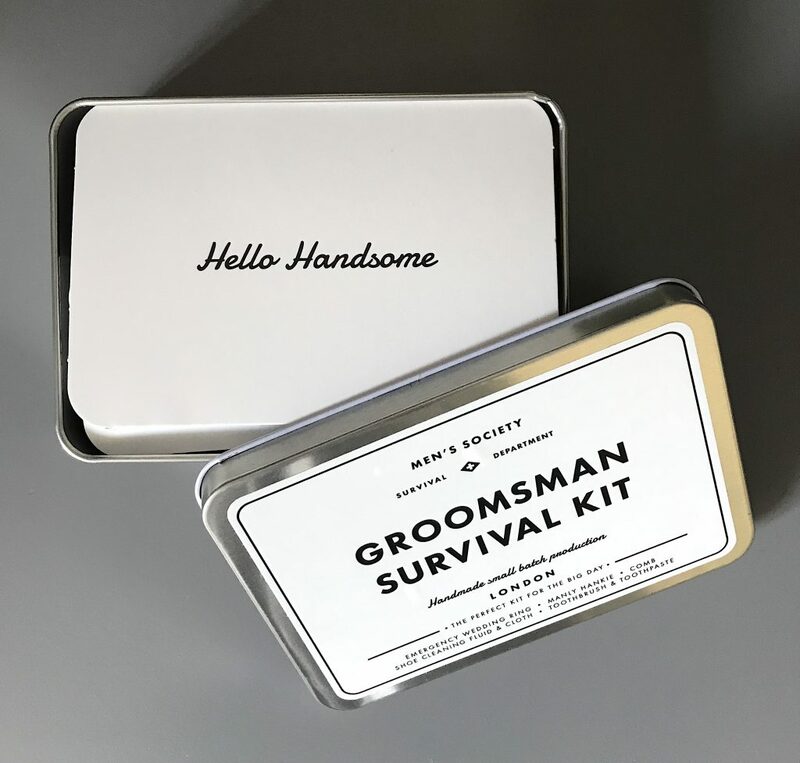 By Men’s Society, the place to get handmade, thoughtful gifts for men and women, the Groomsman Survival Kit is filled to the brim with essential wedding day items. 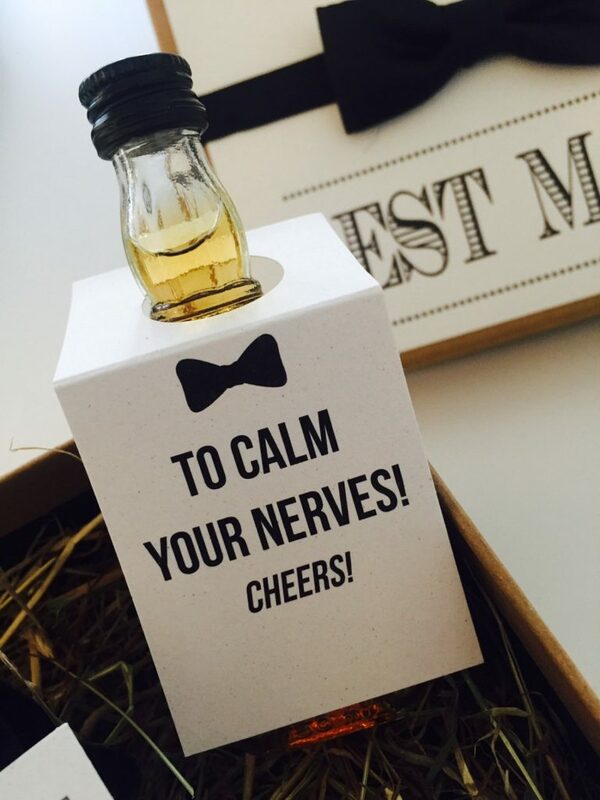 A useful, quality gift for the Groom and Best Men, sure to put a smile on their face on one of the most nerve-wracking days of their lives! A bronze back-up, just in case! For beards and head hair alike. For a quick after-canape freshen up. Probably one of the most forgotten items on the big day. 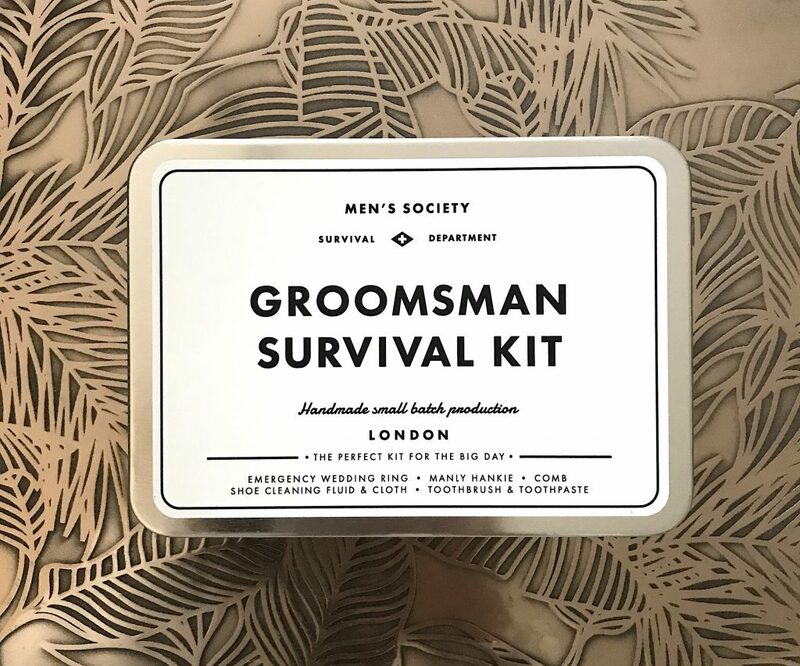 You can purchase the Groomsman Survival Kit here for just £25. 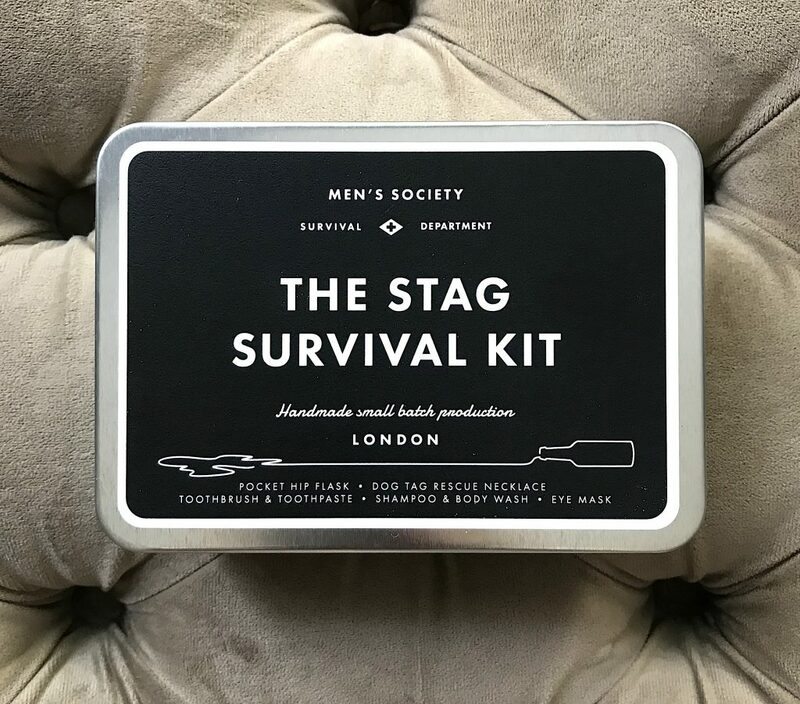 Here’s another suggestion by Men’s Society, the place to get handmade, thoughtful gifts for men and women. 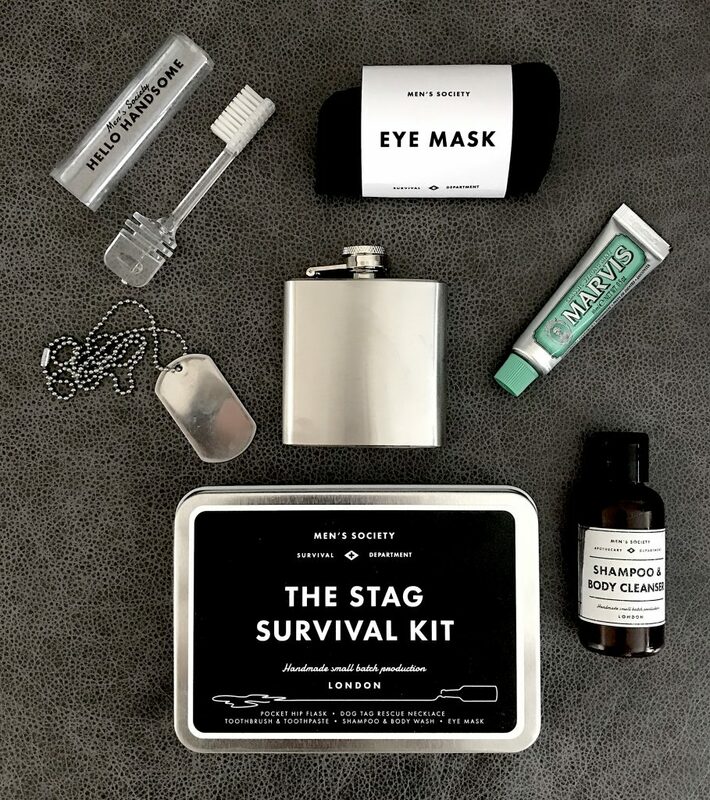 The Stag Survival Kit is packed full of essential stag event items. 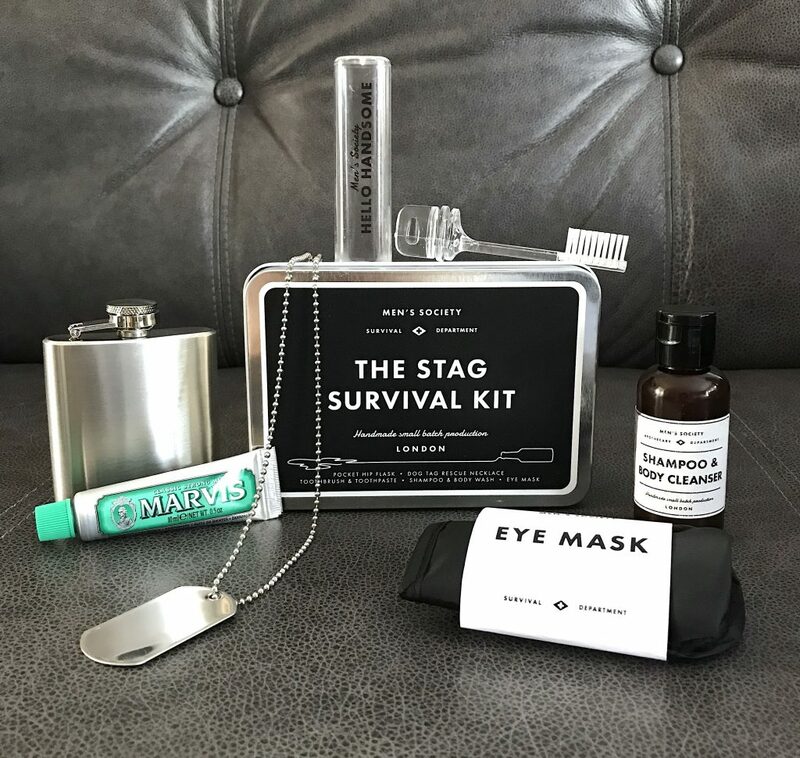 A humorous, but useful gift for the stags heading off on rowdy or classy stag weekends alike! For dutch-courage, or a sneaky sip whilst travelling. For a quick freshen up on the go. For a fresh, not furry mouth. For planes, trains and automobiles. 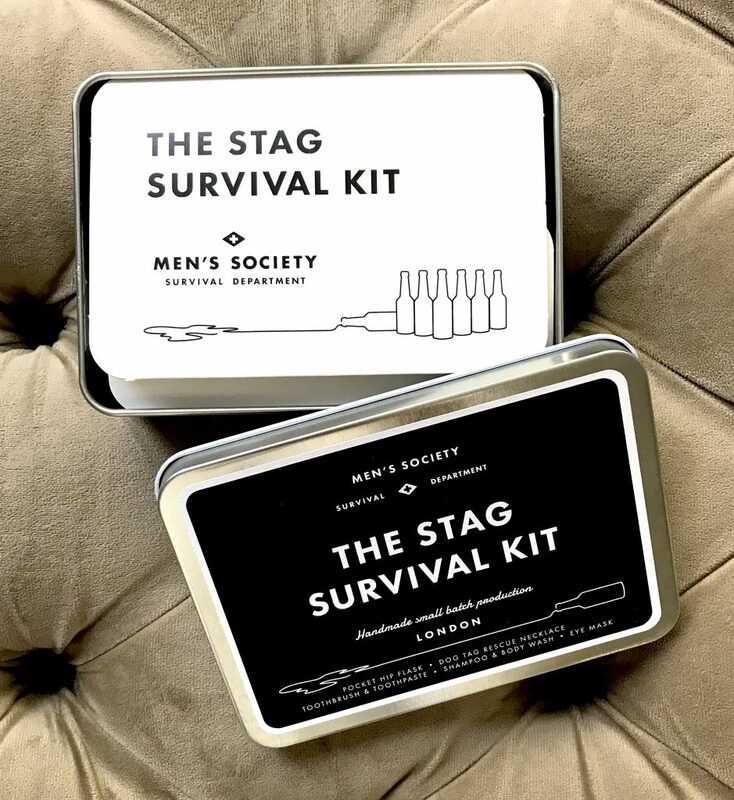 You can purchase The Stag Survival Kit here for just £25. 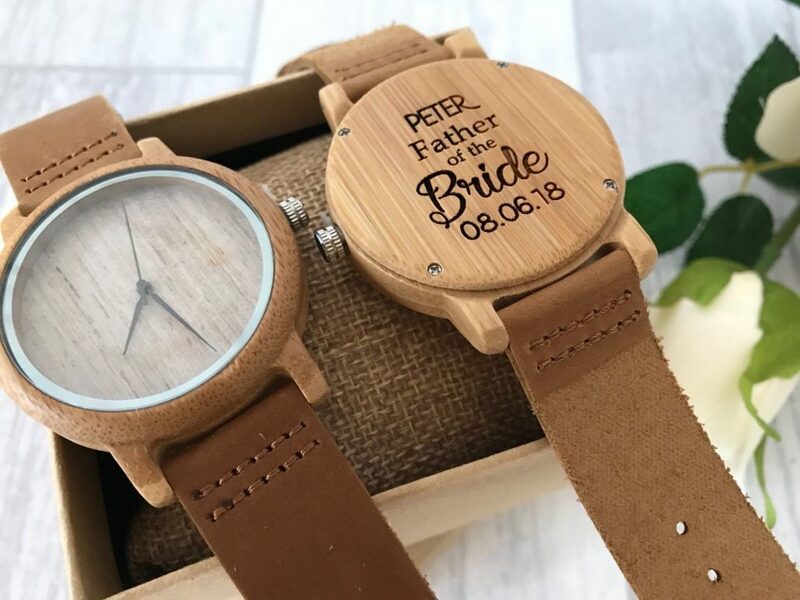 This beautiful wood and leather crafted watch is a perfect gift for pretty much every one on your male wedding party list! 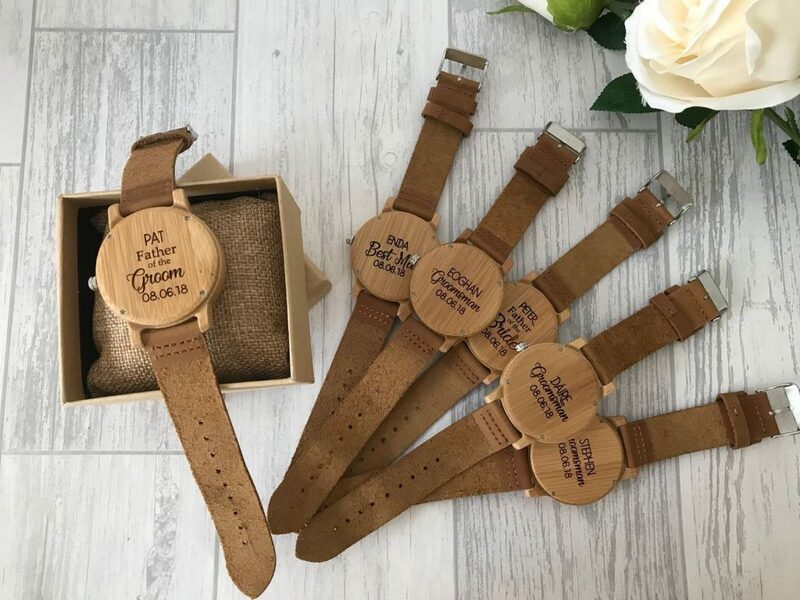 The watch can be personalised with the words of your choice, making it perfect for a father of the bride wedding gift, for the groomsman or best man/men. 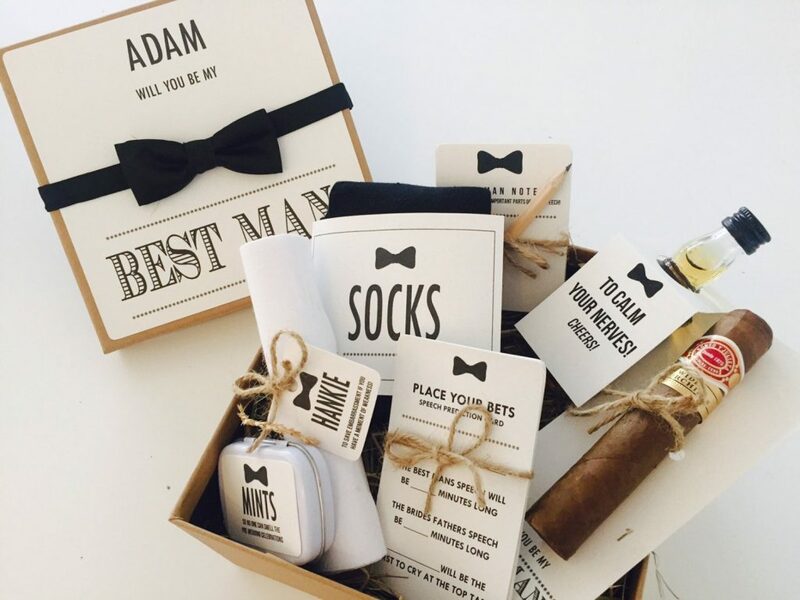 At just £29.99 per watch, it’s a wonderful, low-cost choice of men’s wedding gifts. You can get the watch here. 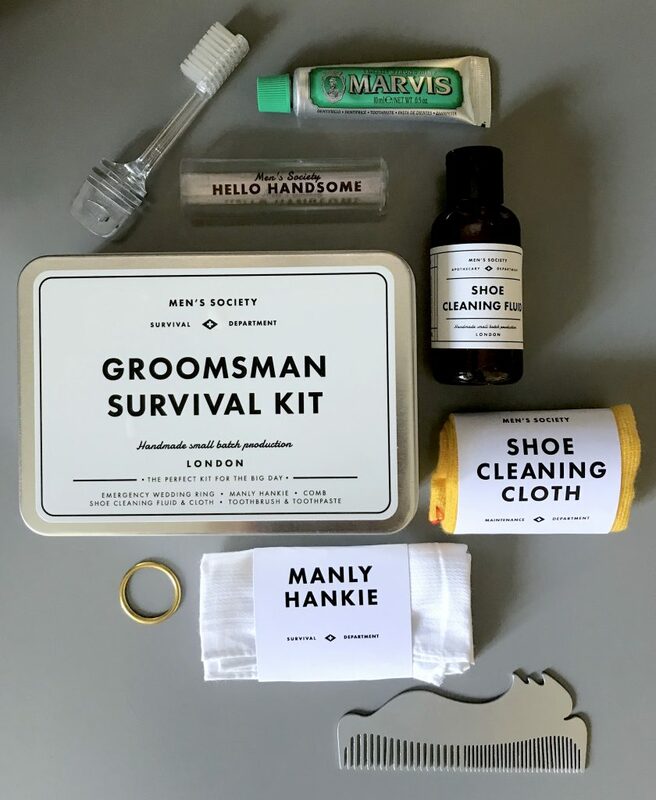 Spoil your best man with this jam-packed gift box containing the things he needs to help you have the most amazing wedding day! 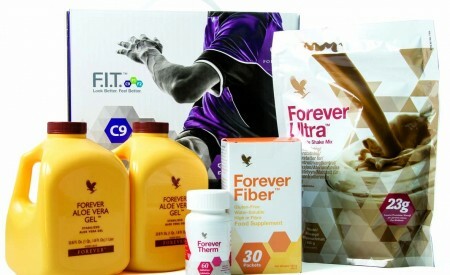 Get the box for £20.50, here. 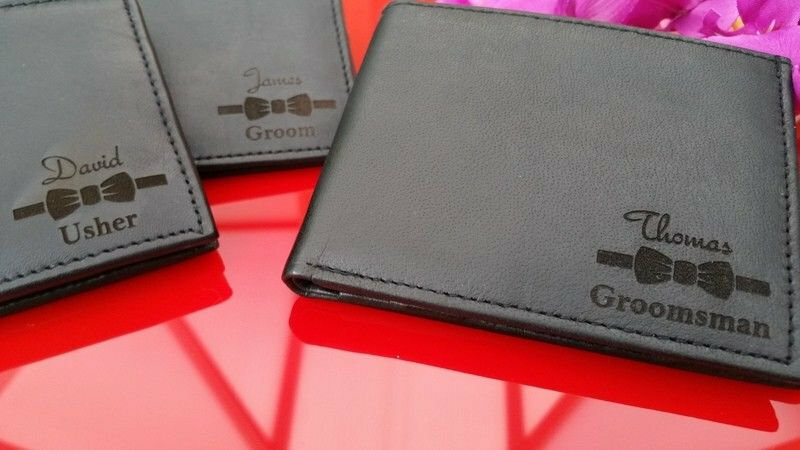 This personalised engraved leather wallet with bow tie motif is the absolutely perfect fit for men’s wedding gifts. 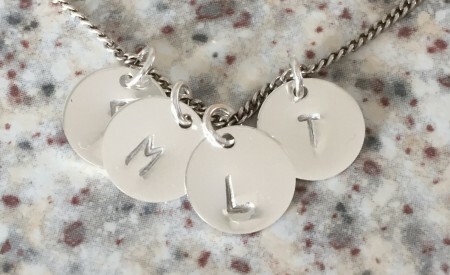 They would make a really great keepsake, and can be personalised with any text you like. 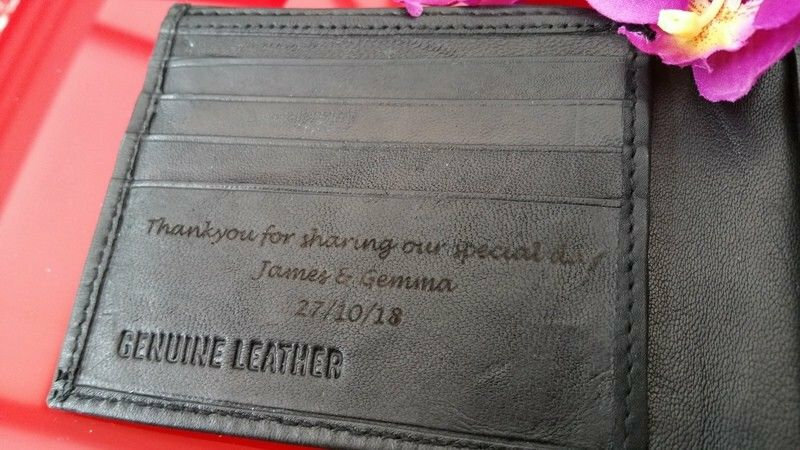 At under £20 a wallet, not only is it useful, it’s thoughtful and shows you appreciate them being part of your special wedding day, and it won’t break the bank!